I'm going to have a heat stroke, I tell myself. The heat, it's too much to bear. I turn on the fan. For the first two minutes I feel cool, but the air gets warmer every minute. The fan becomes a blower. So I head to the bathroom and turn on the shower. The comfort is momentary because five minutes after I get out, sweat starts tickling all over me. The summer dry spell. We need snow. I turned 20 yesterday--the official end of my teenage years, the crucial prelude to adulthood. Until now the thought still overwhelms that I have to constantly remind myself that everyone--and not just me--goes through this phase of life. After Sunday service, my brother and I ate a hearty lunch at a restaurant along Timog. I wanted my birthday "celebration" to be as simple and quiet as possible. I also didn't have cash to treat my friends out, and I needed time to think. Stuffed and sleepy after the meal, we spent the afternoon at home, until such time when manong and Kuya John left to see Ate Joan and Kuya Arbie in the University graduation ceremonies. Left to myself, I continued watching tv but decided to stop when it finally dawned on me that April 22 only comes once a year, and I didn't want to waste it with news about Baby James. So I looked back at my life. Flashbacks of past events came rushing through me like an old movie. The moment I tried to piece them all together, these pieces of memory formed what seemed to be a mosaic that cried out with all its might: GOD IS FAITHFUL! I always tell my friends that who I am and who I will be are because of what God has done for me. I could never bask in the glory of myself because I have nothing to boast of in the first place. So what about the trophies of life that I have accumulated for the past 20 years? They all boil to nothing. I pray that the Lord give me faith to count them all rubbish compared to the "excellence of the knowledge of Christ Jesus my Lord" (Philippians 3:8). My prayer and birthday wish was for God to "restore to me the joy of His salvation" (Psalm 51:12) because there have been times when I lived not for Him but for myself. I sought my glory more than His, and it was during these times when I felt saddest, lowest, and all my efforts at life seemed to be futile. "One thing that I have desired of the Lord, That will I seek: That I may dwell in the house of the Lord All the days of my life, To behold the beauty of the Lord, And to inquire in His temple." Higher Rock Christian Church will have a medical mission-relief giving program on April 19-23 at Brgy. Balading, Malinao, Albay. This town has been hit by two consecutive typhoons that left most of the people homeless and hopeless. The main objective is to preach Christ's message of salvation to the lost there. It also aims to alleviate the pain and suffering of the people by the giving of relief goods, free medical check-ups, among others. Let's commit in prayer the people in Brgy. Balading--that the Lord would prepare their hearts for the Gospel. We must also pray for the missions team—that the Lord would use them for His glory! I'm checking my mailbox when my brother asks, "Uy, what's that?" "Nothing," I say casually--it's short for, "Nothing that really concerns you, so please go about your business." He doesn't budge but stays behind me instead. I don't shoo him away, of course. Instead, I motion him to come nearer. "Here, read this," I say. It's an email I wrote to a friend. "See?" He reads some parts of it. "Strange. You're actually capable of emotions," he tells me. I laugh my heart out. I'm emotional like that. Yes, I still write this from Manila. 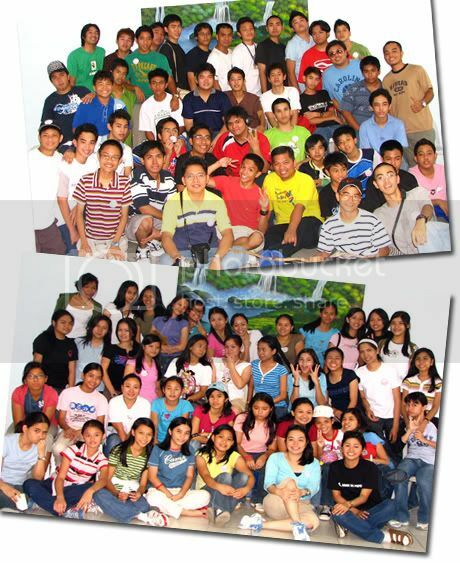 I haven't gone home yet, the reason being that I attended the church's summer youth camp in Dasmariñas, Cavite. I had fun. The camp theme was Made for Joy; the theme verse, Revelation 4:11. The main message echoed throughout all the discussions and plenary sessions was that God made man for his own pleasure; man should live to glorify him. It is only in God where true joy is found. God is most glorified when we are most satisfied in him. --Kuya Lito Sto. Domingo, the youth pastor, orients the campers upon arrival in Camp Jabez. --The getting-to-know game. Campers roam around the plenary hall, looking for new faces, and asking others to answer on sheets of paper. The team who finishes first wins. --Team Red-Nosed Rangers works overtime on the last leg of the message relay game. The challenge: facial expressions instead of verbal messages are exchanged. Group Dynamics. We had to look for 89 balls and stuff them in a black pail. These had to be transferred only by pulling the ropes which were attached to the pail. It took us almost an hour to finish this. I lost my wallet this morning. Why are some things just bound to get lost? Listen to my podcast here. If that doesn't work, try going here and click Download. Thanks to Kuya Arbie for the headset with the sleek mic. Again, this is my attempt to be productive in the midst of summer-break idleness. Oh, and one last thing. It's supposed to be a 19-year-old male voice you should be hearing. I called home this morning. I talked to my mother, who was just on her way to the hospital. She checked on how I was doing, and I said, "Great, 'Nay, I'm trying to recover the sleep I lost during the sem." I also chatted with my father who, as always, reminded me to buy vitamin supplements. He asked me when I planned to go home. I said I had no definite plans yet. I've also been told that my Sean is in Davao to attend a church youth camp. I don't know if this is his first time, but I'm praying that the Lord would use this opportunity to deepen my brother's faith in Him. I told my father my sem's finally over. He said, good for me--now I should get all the rest I can. He went to remind me that I couldn't have done it on my own--getting to the finish line of the sem. God helped me get through. When he reminds me of spiritual truths like this, he always sounds so amazed. And for a very valid reason, because what an amazing grace it is indeed.